↑ 1.0 1.1 MacGregor 1957, pp. 229–231; Ridley 1968, pp. 531–534. 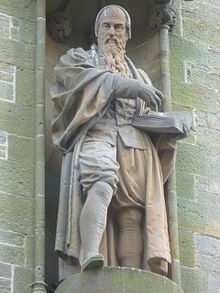 Until David Hay Fleming published new research in 1904, John Knox was thought to have been born in 1505. Hay Fleming's conclusion was that Knox was born between 1513 and 1515. Sources using this date include MacGregor 1957, p. 13 and Reid 1974, p. 15. Ridley notes additional research supports the later date which is now generally accepted by historians. However, some recent books on more general topics still give the earlier date for his birth or a wide range of possibility; for example: Arthur. F. Kinney and David. W. Swain (eds. )(2000), Tudor England: an Encyclopedia, p. 412 (between 1505 and 1515); M. E. Wiesner-Hanks (2006), Early Modern Europe, 1450–1789, Cambridge University Press, p. 170 (1505? ); and Michael. A. Mullet (1989), Calvin, Routledge, p. 64 (1505).